I am reading Newspapers and Nationalism: the Irish provincial press, 1850-1892, by Dr. Marie-Louise Legg. There are also important contemporary developments in Irish media. Irish lawmakers are trying to criminalize the use of social media and technology to spread “fake news” to influence political debate, as detailed by Poynter’s Daniel Funke. Irish Times columnist Una Mullally organized a forum to explore sexual harassment, gender discrimination and female under representation in the media industry. The Irish Times’ parent company has agreed to acquire all the publishing and media interests of Landmark Media Group, the Cork-based owner of the Irish Examiner newspaper and other media assets. Dublin-based Maximum Media, the company behind “digital lifestyle brands” JOE.ie, Her.ie, SportsJOE.ie and HerFamily.ie, is investing in a new Galway office and adding 20 new jobs in copywriting, design, journalism, sales and client services. Learn more about what’s happening in the industry today–and what’s on the horizon for tomorrow–at The Institute of Future Media & Journalism (FuJo) at Dublin City University. 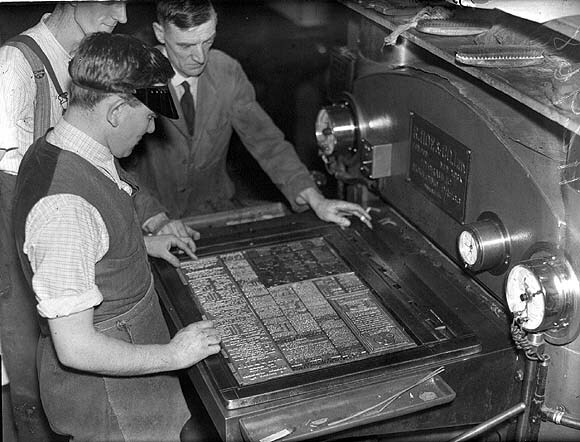 Image of press plates, circa 1935, from the Independent Newspapers Collection at the National Library of Ireland. This entry was posted in Arts & Culture, Business & Environment, Politics and tagged Institute of Future Media & Journalism, Marie-Louise Legg, Maximum Media, Myles Dungan, The Irish Times, Una Mullally on December 10, 2017 by admin.